"Art transports me to another dimension which does not feel earthly but ethereal. Such is the joy I derive from painting." 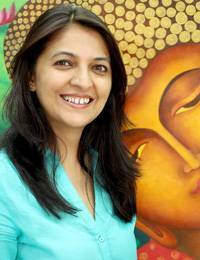 "I'm Sonu Chopra from Delhi, and I believe life gives us a fair share of good and bad times. Life may bring us down but it is on us whether to get up back or not. And so I try to never lose faith in the power of love. I always choose to look at the brighter side of life, and I try to count my blessings rather than the wants in my life. "Life's funny incidents and happy memories are what keeps me going and motivated. I remember I had just started on my first job when I came to know of my pregnancy. Those were the most difficult days for me, I was struggling with ill health and mood swings. It so happened one day that a little girl came up to me and asked me why I was wearing different sandals. I looked down and to my horror found I actually was! The entire day I pretended that my other shoe had broken and with great difficulty I managed to spend the entire day hiding from people. Fortunately, except for me and that little child, no one came to know and I survived what could have been the most embarrassing moment if any of my colleagues had discovered the goof up! "I've been developing my creative side since childhood. I remember, I would sit for hours in my uncle’s store room trying to copy the beautiful pictures on his Urdu magazines. Time would fly like magic and I would feel transported to another world. I love the dreamlike quality of it. Art transports me to another dimension which does not feel earthly but ethereal. Such is the joy I derive from painting. 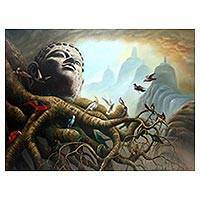 "I started painting professionally much later, since 2002. Initially I had a tough time as I had to go against my family’s wishes, because I quit my job to devote myself fulltime to art. Slowly family came around when I held my first exhibition and I saw pride in their eyes when my work got appreciated My paintings got space in most of the newspapers. That was a very proud moment for me. 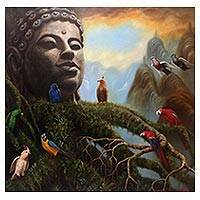 "I am learning from the talented [Novica featured artist] Sunil Jaiswal, he is a well known artist who has been painting for quite a while. He is my guru (teacher). Under his tutelage I have learned the intricacies making a painting three dimensional, and how each layer of paint lends beauty to a plain piece of paper. He has also helped me get rid of my hurried nature. Now I know a painting is never complete. You can always go back to it and add a lot more. "Playing with colors and expressing myself through art has been my hobby, since I was young. 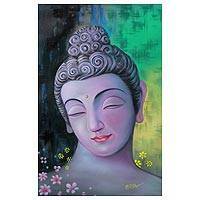 I portray spiritual and meditative moods which are mostly figurative. 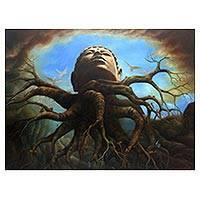 Various visions appear during my meditations which get translated onto my canvas. 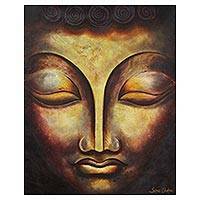 I believe that most of my paintings have been inspired by the divine Himself. There are some which have originated from my longings and desires. Art is in my flesh and blood, it won’t be wrong to say that it is in my soul too. "I want to become a well known artist. I aspire to paint masterpieces which bring joy to everyone. With my customers’ wellbeing in mind, most of my work is done keeping Vaastu and feng shui concepts in mind, because I have observed that positivity brings happiness, and if a person is surrounded by visually positive pictures it brings good fortune. Positive visualization is a very powerful tool to bring about positive changes in life. Visualizing abundance brings forth abundance. In all my paintings I depict themes of love, riches, happiness and contentment. My compositions are intentionally painted in order to made to bring joy and good luck to the person who possess them. "I also had the opportunity to participate in a couple of group show and the experience and the response has been great. The appreciation of my paintings from total strangers is the food for my soul. I gives immense pleasure when my teacher tells me I stand tall amongst the rest of his students. It is challenging to keep bringing out the best. I cannot settle with anything but the best. I hope to have a long and fruitful association with Novica so that I grow as an artist and be promoted on a wider platform." 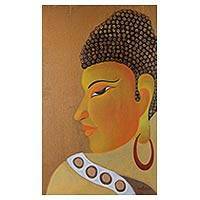 Buddha Painting Signed India Buddhism Fine Art, "Sakyamuni"
Buddhist Temple Landscape Painting in Oil on Canvas, "Wat Ton Kwen Chiang Mai"
Peace and Love Buddha Signed Buddhism Painting from India, "Peaceful Buddha III"
Signed Painting of Buddha with Leaves from India, "Moksha - The Final Truth"